Aging is big business! People today don’t want to look older. Millions of men and women are anxiously lining up at cosmetics counters everywhere, looking to escape signs of aging. Skin care sales have skyrocketed as people layer on product after product to avoid looking older. Society’s obsession with youth has turned the skin care industry into a massive, multi-billion-dollar phenomenon. And that’s where Nutriance, Your Age-Defying Solution, comes in. Nutriance is exactly what people are searching for. Sooner or later, everyone must face the fact that they’re aging a little more every day. While the aging process happens naturally, it is often accelerated by lifestyle, the environment and especially oxidation and ultraviolet rays. With a skin care programme that effectively addresses these concerns, you can prevent many of the signs of aging, protect your skin and thereby defy age. Over the past several years, much has been learned about how skin ages. We now know that the key to defying age lies in curbing predictable changes and that an ultimate skin care programme must be Youth Renewing, Skin Protecting and Age Defying. Nutriance clearly delivers all three! Using the most revolutionary advances in skin care, Nutriance helps stop, prevent and even reverse the effects of time that accelerate skin aging. In fact, Nutriance helps control signs of aging before they start - so you can keep your youthful radiance. When it comes to Nutriance, only the best will do. That’s why the world’s finest Swiss formulators were selected to work with some of the world’s leading scientific minds - GNLD’s renowned Scientific Advisory Board - to develop Nutriance. The extraordinary result is an unmatched skin care line that reflects the highest level of scientific research and industry expertise. So dominant is GNLD in the nutritional marketplace, that the name “Nutriance” was created to extend our rich heritage of unequaled excellence into the skin care arena. As we blend nature, science and skin care technology together into a powerful, synergistic whole, the result is a skin care programme for the new millennium! World-class Nutriance formulas are rich in natural botanicals and phytonutrients. Each product showcases the world's most advanced skin care discoveries and each product performs as promised. To verify the extraordinary power of Nutriance, clinical analyses were conducted in an exclusive European skin care clinic, where the entire line was dermatologist-tested and proven to safely, effectively deliver age-defying results in as little as 10 days. The heart of the Nutriance programme is the Nutriance Synergy Cycle: a revolutionary 5-step process designed to help your skin look and act younger and keep you looking younger, longer. Each product delivers its own specific benefits and fits together with the others in the Cycle, for maximum results. Every product in the Cycle builds upon the performance of the previous product, prepares skin for the next step and multiplies the benefits. You’re probably familiar with the expression; “The whole is greater than the sum of its parts”. This means that the overall benefit is greater than all of the individual steps. With the five steps of the Nutriance Synergy Cycle, 1 + 1 + 1 + 1 + 1 is more than 5, it’s 5+! This is known as “synergy.” And when you use Nutriance over time, the "pluses" increase. Nutriance can turn back the hands of time! It’s your age-defying solution. All Nutriance facial cleansers, toners and moisturizers contain carefully-selected botanical extracts targeted for your particular skin type. Each natural ingredient was chosen specifically to help your skin achieve and maintain an ideal, youthful moisture/lipid balance. Supplementing your skin’s moisture levels with selected extracts enables your skin to more effectively retain the moisture it produces. As moisture levels increase, skin looks smoother and younger. Wrinkles, fine lines and pores diminish, revealing a soft surface texture. The Normal to Dry skin formulas contain these selected botanicals: Orange Flower Extract, Eyebright Extract (Euphrasia), Ivy Extract and Sweet Almond Extract, to help skin increase lipid production. The Combination to Oily skin formulas contain these selected botanicals: Witch Hazel Extract, Tormentil Extract, White Oak Bark Extract and Sage Extract, to slow down lipid production. Nutriance provides the deepest level of antioxidant and ultraviolet protection. Collagen and elastin are important skin components. They form the resilient structure that keeps your skin firm and smooth. Damage from oxidation and ultraviolet rays can threaten youthful collagen and elastin structure, break down elasticity and cause skin to wrinkle and sag. In addition to specially-selected botanical extracts targeted for each skin type, Nutriance delivers a second powerful herbal blend to help boost antioxidant and immune protection against factors that can accelerate aging: Green Tea and Echinacea. Included in our cleansers, toners, moisturizers and Renewing Antioxidant Treatment are Green Tea to help protect youthful structure and elasticity from breakdown caused by oxidation and Echinacea to support healthy immune function. Without antioxidants, aging accelerates. Nutriance also provides three important antioxidant vitamins, Vitamins E, C, and A, to support and protect youthful skin. Vitamin E, the skin’s ultimate antioxidant protector, saturates the lipid areas inside and outside cells, including membranes and constantly protects against free radical attack. Vitamin C and its related constituents deliver antioxidant protection to the watery portions of cells. Vitamin C is also essential for skin healing and the formation of collagen. Vitamin A offers antioxidant protection for lipid portions of cells, stimulates cell production and enhances the texture, firmness and moisture level of your skin. There is considerable concern about oxidative damage from free radicals within the collagen of the skin. Vitamins E, C and A together help stop this damage! UVA is for aging. UVA rays break down the collagen and elastin fibres in your skin and cause wrinkles. UVB is for burns and “bad” things like skin disorders. When your skin burns, it can lead to melanoma, a deadly form of skin cancer. 2) By fortifying cells with powerful antioxidants to minimize destructive impact on skin. This age-defying combination helps your skin stay more youthful, firm and resilient! GNLD has solved a problem that no one else has been able to solve. It’s common knowledge that skin cells naturally renew, but with age, that process slows down. We’ve discovered a breakthrough method to stimulate skin cell metabolism, by using the skin’s natural tendency to renew safely, without relying upon the use of assaulting acids. This unique system brings nutrients to the basal skin layer, where they stimulate and speed up cellular renewal. The process is called ACR: Activated Cellular Response - GNLD’s most important age-defying breakthrough! Dry. Skin feels tight or itchy and shows tiny wrinkles. Skin may be somewhat flaky. Normal. Skin feels neither dry nor oily, but is somewhere in the middle. Combination. Nose and chin (and possibly forehead) can be oily, while the cheeks are dry. Oily. Skin produces more “sebum” or oil than average, which can lead to blemishes. Your skin also has unique needs according to its colour, your geographic location and the extreme changes you experience with the seasons of the year. The Scientific Advisory Board took these factors into account in the creation of Nutriance. No matter what your skin type, colour or circumstance, Nutriance has a skin care programme in place that is ideally suited to your needs. As described earlier, each Nutriance product is designed to act with the others to form a synergistic system. 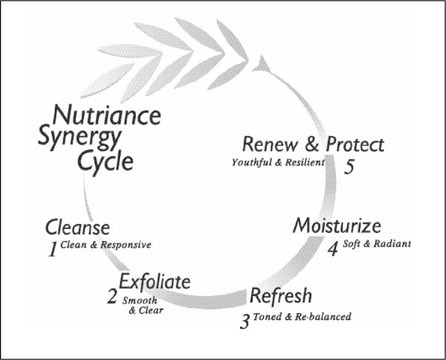 To enjoy the full benefits of the system, follow each important step of the Nutriance Synergy Cycle: Cleanse, Exfoliate, Refresh, Moisturize and Renew & Protect your skin. Cleanse your face and neck with Refreshing Facial Cleanser or Foaming Gel Cleanser. Nutriance cleansers gently, effectively remove facial oils, makeup and other surface impurities, leaving your skin feeling clean and responsive to the next step. Each cleanser helps your skin find the appropriate moisture-lipid balance, to promote youthful moisture retention. The mild foam in Nutriance Foaming Gel Cleanser makes it ideal for close, comfortable shaves. Following shaving, skin feels dramatically more touchable - soft, smooth and firm. The second step is to exfoliate with Purifying Facial Scrub. This is a special pampering that you give your skin once, twice, or three times a week, depending on your skin type. This exceptional formula stimulates circulation and accelerates cellular renewal with ultra-fine Walnut Powder and Witch Hazel and soothes with Aloe Vera and Chamomile. You can use Purifying Facial Scrub either at the basin or in the shower. You’ll feel the ultra-fine grains gently clear away dead skin cells, stimulate circulation and leave your skin incredibly soft and smooth. Complete the final stage of cleansing with Refining Toner or Balancing Toner. These mild toners remove the last traces of surface impurities while balancing and refreshing your skin. Nutriance toners deliver selected botanicals tailored to your skin type, which help rebalance moisture-lipid levels. Plus, Green Tea and Echinacea deliver herbal antioxidant activity and immune support. As you tone your skin, pores will appear smaller and your skin will take on a healthy glow. Both of the toners are alcohol free and gentle to your skin. You can either moisten cotton wool with your toner and gently sweep it across your face, or splash it on after shaving. Enriching Moisturizer and Revitalizing Moisturizer effectively hydrate your skin, as well as boost natural moisture retention with specially selected botanicals. Green Tea helps neutralize free radicals before they can damage cells, Echinacea helps support healthy immune function and broad-spectrum UVA and UVB sunscreens defend collagen and elastin to protect against photo-aging. Aloe Vera soothes and helps skin retain moisture. The result? Fine lines and wrinkles diminish! Your skin looks and feels younger. GNLD’s exclusive breakthrough product, Renewing Antioxidant Treatment, is like nothing else found on the market. Only Renewing Antioxidant Treatment contains GNLD’s most advanced skin care discovery: ACR - Activated Cellular Response. Proven to be Youth Renewing, Skin Protecting and Age Defying, this exclusive formula stimulates activities inside cells, reawakens skin metabolism, and “reverses time” for skin cells. Fresh, new cells rise to the surface quickly and naturally, filling in lines and wrinkles and enhancing skin’s moisture retention abilities. In as little as 10 days, tired, sluggish metabolism can be reversed. Skin looks, acts and feels younger, softer and smoother! Renewing Antioxidant Treatment delivers potent antioxidant protectors, Vitamins E, C and A, to intercept and neutralize free radicals that prematurely age skin. Green Tea and Echinacea offer additional antioxidant protection and immune support. This extraordinary formula also halts accelerated photo-aging with broad-spectrum UVA/UVB protection to help maintain skin’s youthful structure and elasticity. Totally unique Renewing Antioxidant Treatment is available only from GNLD. With every day you use it, you do something incredible for your skin: you defy age. This phenomenal skin care programme can have you looking more youthful in less than 10 days. Your skin will look and feel better than it has in years! It’s going to feel clean, hydrated, healthy, soft, smooth and firm like never before. Better still, over time, you’ll look years younger! Sometimes your skin needs extra special attention. An ideal soap-free cleansing bar. Clinically proven to be non-irritating and therefore perfect for sensitive skin. For added morning or evening moisturizing, choose Nourishing Collagen Cream. It bathes skin in a rich complex of Hydroelastin, Mucopolysaccharides and pure Swiss Collagen. Aloe Vera and Cucumber Extracts, Squalane and Panthenol provide additional moisture. Water-soluble Nourishing Collagen Cream plumps skin cells and enhances moisture retention. Aloe Vera moisturizes, soothes and aids skin that has been overexposed to the outdoor elements; sun, cold and wind. Vitamin E, Pro-vitamin B5 (Panthenol) and Chamomile Extract further soothe, moisturize and soften. While you sleep, your skin basks in an exclusive blend of natural Aloe Vera, pure Swiss Collagen and natural Vitamins A (Retinol) and E. Natural humectants and moisturizing lipids gently deep-condition your skin, helping to minimize visible signs of aging. This extra-rich formula shields against moisture loss, while delivering generous moisture, so you wake up with soft, smooth, silken skin. The key to defying age lies in curbing the signs of time and the environment on your skin. You need the very BEST skin care programme available anywhere: Nutriance. Only Nutriance is Youth Renewing, Skin Protecting and Age Defying! Nutriance can turn back the hands of time. Your secret weapon in the war on aging, clinically-proven Nutriance can help stop, prevent and even reverse the effects of time that accelerate skin aging. In fact, Nutriance helps control signs of aging before they start - so you can keep your youthful radiance. Don’t wait another minute to enjoy the benefits of smoother, firmer, younger-looking skin, with Nutriance ... your age-defying solution!